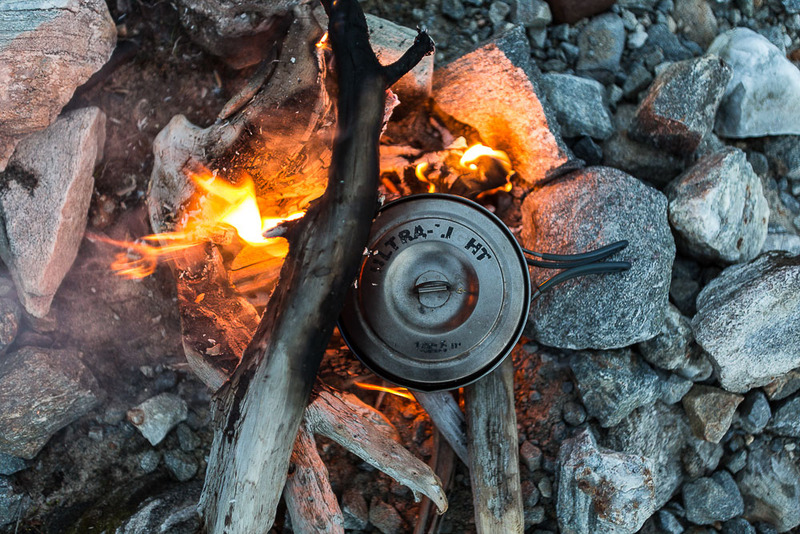 As we move into peak walking and camping season, I wanted to spend some time on what seems to be a controversial subject; camp fires. There’s a huge range of attitudes towards when, where and why it’s acceptable to make a fire outdoors, even among experienced outdoors people and professionals, but there’s also a lack of public discussion which seems to me to be much more harmful than useful. I’ve also seen a fair amount of ‘social shaming’ dished out to folk posting pictures of campfires online, regardless of their age or experience… and of course the more you tell someone not to do something, the more you can provoke them! A contained fire made with abundant driftwood on a shingle and stone riverbank. There was zero trace of our fire once we cleared the site in the morning. 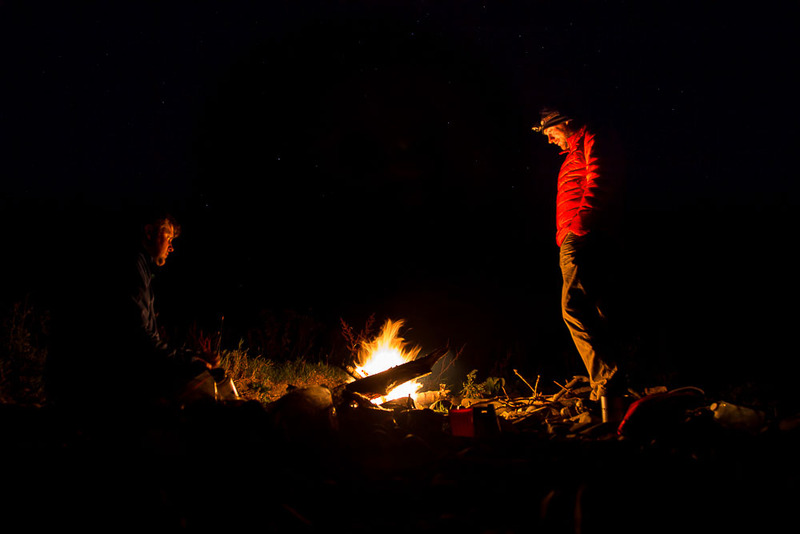 One of the problems with campfires is… well, there’s a lot to like. As my friend Andy says ‘fires warm the soul’ and deep in our soggy, end of day boots, we know he’s right. No amount of grown ups wagging fingers and tutting will make the collective, primeval love for staring into embers vanish. It provides a focal point for a group, warms against the chill and can be used to cook. But the problem with images like the one above is they help perpetuate this desirability, but tell you nothing of the preparation or the conditions under which the fire was made. I can see why some outdoors forums and magazines have a zero tolerance policy towards these pictures, because they create an expectation that it’s OK to have a fire whenever you want to. Newsflash – it isn’t. The first thing to establish here is: A campfire should be a rare and treasured thing. I can easily spend 50 or more nights at camp each year, but might have a fire two or three times per year AT MOST. I confess I really do enjoy those fires, partly because this is not something I do every time I go camping. So, campfires are a luxury not a necessity. I can’t think of a single time in the UK when I’ve needed a fire in order to save life, and that includes sub zero paddling trips. 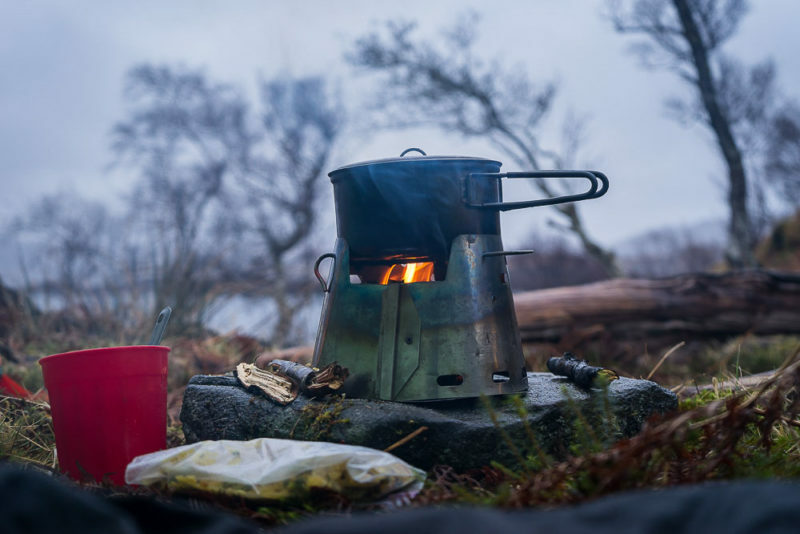 A small stove is infinitely faster and more versatile in cold or rainy conditions for making hot food and drink, and besides, a whole range of other conditions need to be exactly right to justify setting fire to bigger stuff! A small fire using wood brought in by canoe, on an island on Loch Lomond. This fire was made on a sandy beach, making a shallow pit and bordering with small stones. Again, zero trace was left in the morning: logs were burnt to ashes and not wasted, the ashes scattered, before the sand removed from the pit was replaced. I dislike rules and regs when I’m outdoors as much as anyone, so why all the fuss? Back in May this year, a series of ‘wild’ fires swept across Scotland during the prolonged dry spell. A 2-day fire blazed away in Lochinver, followed by others in Sutherland, the Ochils and then Glen Etive. The latter was certainly caused by a campfire, irresponsibly set. While wildfires do occur naturally, all fire causes massive damage to local wildlife and landscape, and of course are hugely polluting and dangerous to the human population too – whether they are visiting, or live in the area. There’s also the more obvious visual impact of fire circles not cleared afterward – popular areas like Applecross bay, Lomondside and Loch Awe suffer from multiple fire circles, often just metres away from each other. These scar the landscape, and burning wood that is found locally depletes habitat for wildlife. Less places for insects to live, means less food for birdlife… and so on up the food chain. If we’re not extra careful, by making a fire we’re making a desert. This fire was built on a rocky shoreline, below the tideline. Foraged driftwood kept the midges at bay and cooked my food. Zero trace was left. With more and more people enjoying camping out, it’s important they hear the the right information – especially newcomers – so we don’t end up loving these places to death. I also spoke to Mountaineering Scotland’s new access officer, and for my money his response made a lot of sense. Use a stove whenever possible. If you do make a fire, make it on stones, sand or shingle. Below the tideline is best. Make it small, certainly no bigger than 2 hand widths long on each square side. Always better to make new friends than a new fire circle. Never make a new fire circle when you could use or share another one close by. Never ever cut live trees – they don’t burn anyway! If you plan on making a fire, always take wood or coal in with you. Never make a fire on peaty soil, or in periods of dry weather. Never ever make fires on the open hillside or high on the hilltops. Have a plentiful supply of water to hand to douse the flames. Clear all trace of your fire. Scorch marks are to be avoided at all costs. No-one should be able to tell you have had a fire once you leave. If you can’t guarantee the above conditions as you look around the site and make your assessment, then the answer is ‘not this time’. 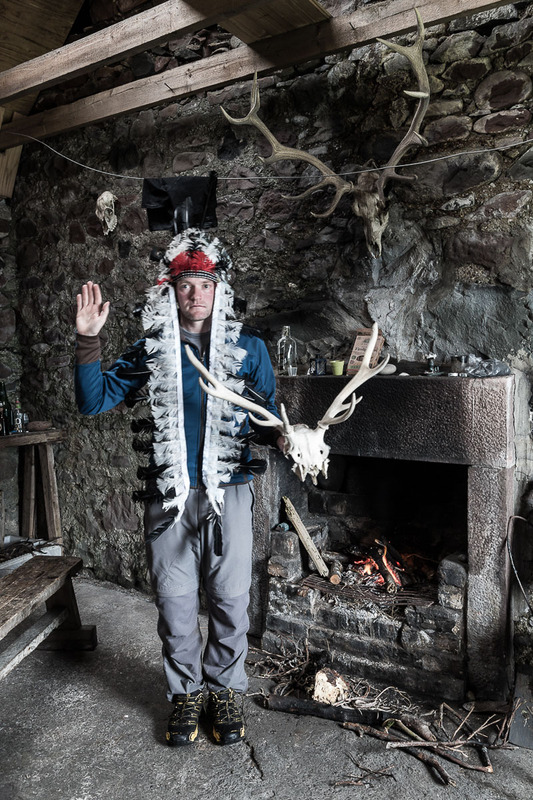 Bothy fires are probably even more sociable than open campfires. There’s something magical about huddling around a fire in a lonesome building far from the road, making new friends and sharing a brew or a dram. They are a fantastic option in the darker months after the clocks go back. They are even lots of fun when you are alone, or in fancy dress. Guirdil bothy fire, made with driftwood from the beach outside the bothy. For info, I did have company and I’m not a mason. If there’s little or no dead wood around to use, then there’s nothing to burn and you shouldn’t be having a fire. If there are trees and little or no deadwood (a popular camping spot like Derry Lodge, for example) that should tell you that all the wood has been foraged already… and you need to bring in your own, or not have a fire at all. Ask yourself that question from Mountaineering Scotland I mentioned above… and be honest in your answer! I am not at all convinced about the presence of wood saws in most bothies. At Guirdil, Sourlies and many others I’ve found evidence of visitors using these to cut live trees down – totally unforgivable in our tree depleted landscape and pretty useless given how badly green wood burns. I’m not at all proud of it, but I’ve even felt the need to remove a page from a bothy book, which gave grid references locating live wood for others to chop… as if this was a public service! Don’t be a vandal; bring your fuel in. There are a few brands that will enable you to enjoy a small fire in a much more contained and responsible way. Some of them are even modular, so you can team up the different parts with a meths burner when conditions don’t allow for a wood fire. I’ve used a few of these for years, especially on longer European trips where woodland cover is much greater. They can help with fuel weight between resupply and are a useful addition to your kit… but as you might expect, the chances to use them in the UK are fewer and further between. Once again, that golden rule of frequency applies – a wood fire is a luxury, not a necessity. Think of it as a bonus, not something you are entitled to have. Just a few twigs were enough to cook my dinner, although the wood was damp and took a while to get going. Note the large flat stone as a base to completely protect the ground. What you can’t see is the massive, 1msq fire circle scar I was camped next to, left by the frequent canoe groups that use this island. The same friend I mentioned earlier, Andy, is playing with a method often used in the States for big river trips. 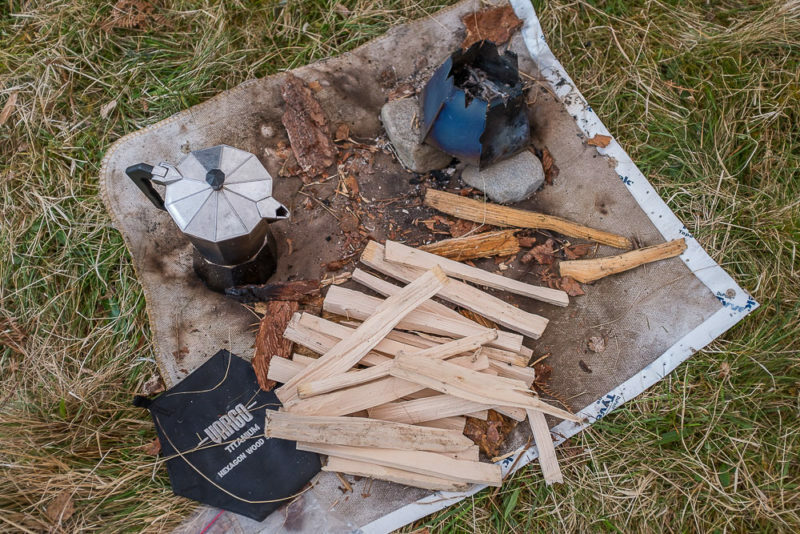 Cut a piece of fire blanket to size, locate some good, non peaty ground as a site, and place some stones or mineral soil (perhaps gathered from around the base of a tree) on top of the blanket. Build your fire on top of this. The fire blanket does help to protect the ground to a certain extent, but it isn’t fool proof and unless you are careful you’ll still get a scorch mark. It’s even better to make your fire on sand or stones below the tideline, to which the fire blanket adds even more protection. A picture of Andy’s setup as a demonstration, this time used with a small woodburning stove. Note the stones for a base on top of the blanket, and wood brought into the location, not foraged. An advantage of these stoves is they are very efficient… which helps with carrying fuel weight, and the environment! 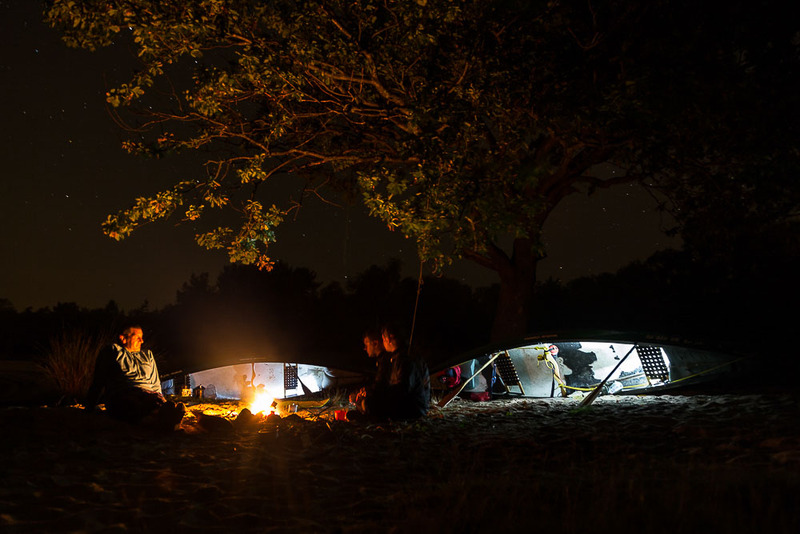 If the above options still don’t quite hit the spot, and especially if there’s a group of you out for a social, you could do a lot worse than stop at a garage for a couple of bags of logs, and head for a campsite with fire circles already on site. You’ll only need to carry the wood (and the booze) a few metres from your boot, too. 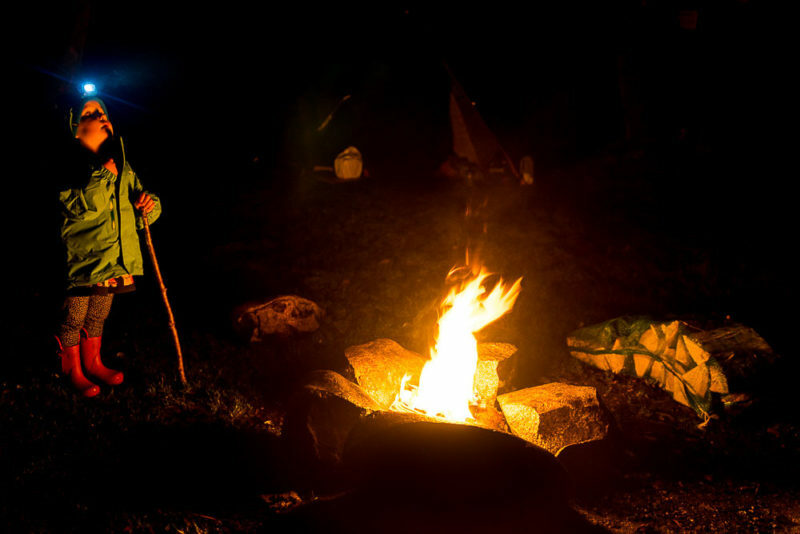 Nipper enjoying her first campfire and stargazing session. Note the purchased bag of logs on the right. Formal campsites which allow open fires tend to be a lot less stuffy and official feeling than their less pyrotechnically inclined cousins. They are great for bigger groups and families, especially in winter. A favourite of mine is the Red Squirrel in Glen Coe, pictured above, but there are plenty of other choices, from Badrallach in the northwest to Comrie Croft in Perthshire. There are a few in the Trossachs area and a smattering in Dumfries and Galloway, too. A quick Internet search on ‘campsites in Scotland with camp fires allowed’ will furnish you with at least a dozen options. Again though, the same rules apply. Don’t build a new fire circle, keep the fire contained, have some water close at hand, and clear up after you. Fires are magic, but so are the places where we have them. Please – let’s keep them both that way, we can all enjoy them long into the future.